Diet To Go combines online support with healthy, fresh, delivered meals to help you lose weight. It’s dishes are designed by chefs, cooked freshly and delivered weekly, so all you need to do is choose, reheat and eat the meals that most appeal to you. Traditional is simply a diverse range of breakfast, lunch and dinner. These items have been designed to provide complete nutrition and great taste, whilst also being low in fat and other unwanted ingredients. You can start off by ordering the general range, then start to pick and choose items which you prefer. The alternative menus for vegetarian and low carb diets tend to be a bit more expensive for certain items, but not much more over all. how many meals you’d like per day (2 or 3). This allows you to tailor the system to how you prefer it, and if you would prefer to make a meal for yourself on weekends or breakfasts, that’s fine. Each week you receive a fresh delivery of meals. You also need to pay for delivery, so it’s worth keeping this in mind when you make an order. Food isn’t cheap, per se, but considering you do no cooking and don’t need to count calories (plus the food was rated the tastiest, according to the website), it’s still really good value for money. 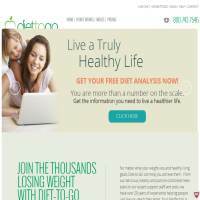 Aside from delivering weight loss food to you, the website also offers a few tools. You can download a mobile app which helps you to keep notes on what you’re eating and how many calories and nutrients it contains. This is particularly useful if you go out for a meal, but also if you simply take an item from their menu to work and forget to log it at home, or add a piece of fruit to your day, for example. The mobile and web apps also synchronize with FitBit, meaning you can input your daily exercises and activities to see if you’re burning off enough calories. This is useful even for just monitoring your walking, as you may discover that a few more steps a day could make all the difference overall. Support is on hand too, either from the team (which includes professional dietitians and nutritionists, as well as a health coach) or through the online community. You can easily log in and share your thoughts on weight loss topics, the food, exchange recipes and more on the forum pages. Everything considered, we feel that DietToGo offers a really unique service. As well as some handy tracking tools, its healthy, chef-designed, weekly delivered food is meant to be really tasty, so you may not even notice the difference, except for your weight dropping. You can continue to enjoy the foods you like, without the hassle (and potential calorific inaccuracies) of buying ingredients and cooking meals for yourself. If this weight loss model appeals to you, why not explore Diet To Go for yourself?